It almost makes me hurt a little when I see enormous brilliance limited by small thinking. Look at Einstein - he thought big. If he had been content to make a couple theories in his garage, he never would have made the atom bomb, and then where would we be? In a world without Fallout, that's where. Now, if we could just make John Clowdus see that he is depriving thousands of nerds the opportunity to experience his genius, maybe John could create the next awesome game setting, and we'll have even better video games. Or at least we could all play Omen. I've already reviewed Omen. You can read about it right here. In case you're lazy, I'll sum it up - Omen is a card game about war where you will kill a bunch of ancient Greeks and lay waste to cities. Also, it is awesome. Sadly, if you didn't buy it when it was in pre-order, you're completely out of luck. You can't even find it on eBay. It's a fantastic game that everyone should play (unless you don't like war, in which case you should buy Monopoly), but you can't get it any more. And that makes me sad. Shattered Aegis is everything an expansion ought to be. When Clowdus decides to give you more game, he doesn't play around. There are more new ways to play Omen than you could possibly use in a single day, unless you spent the entire day playing the same game over and over. Which, in the case of Omen, would be a very good way to spend your day. The easiest way to use Shattered Aegis is to just shuffle all the new unit cards into the old cards, and just let 'er rip. Now, fair warning - John needs to have a serious heart-to-heart with his printer, because the cards don't match up as well as they should, so you can tell pretty easily if your opponent is holding expansion cards or original. However, it won't really matter, because there are a ton of new cards, so it's not like you'll know what he has. You'll just know it's new. With all these new units, you're going to see the game take on entirely new dimensions. If you like going heavy with oracles and playing them for their ongoing bonuses, you'll love all the new ones. Before, the oracles were mostly pretty benign, and just helped you out. Now there are some nasty oracles in here, like the one who robs your opponent every turn, or the one that scares the piss out of the enemy naked chicks and sends them running home to their mommies. The new soldiers are pretty awesome, too, and so are the new beasts. There will now be plenty of new ways to manipulate the table to your liking - play the Solemn Arbiter and use your opponent's oracles, or play the Masked Surrogate and make his soldiers work for you. Or throw down the Brazen Slayer, and get a beast card for free, or the Fortuitous Dryad, and score an extra feat card without having to work for it. If the only new stuff in Shattered Aegis was a bunch of new units, it would be worth every penny. But like I said, Clowdus doesn't play around when he makes an expansion. There are also a lot more ways to play the game. You could always play a draft-style game, where you build your own deck before you start playing (and with all the new units, that's even better now), but now there's the pure deck-building variant, where each player has his own custom-made deck composed completely in secret before the game even starts. There's a really awesome four-player variant (using the extra feat cards in the box, plus some cool new hidden cards) that will let you break the legs of more of your friends at once. There's more, too, but this paragraph is starting to get really long, and it's wearing out its welcome. But I still have one really enormous complaint, and it's one that John Clowdus should address as soon as possible - you can't get the base game any more. 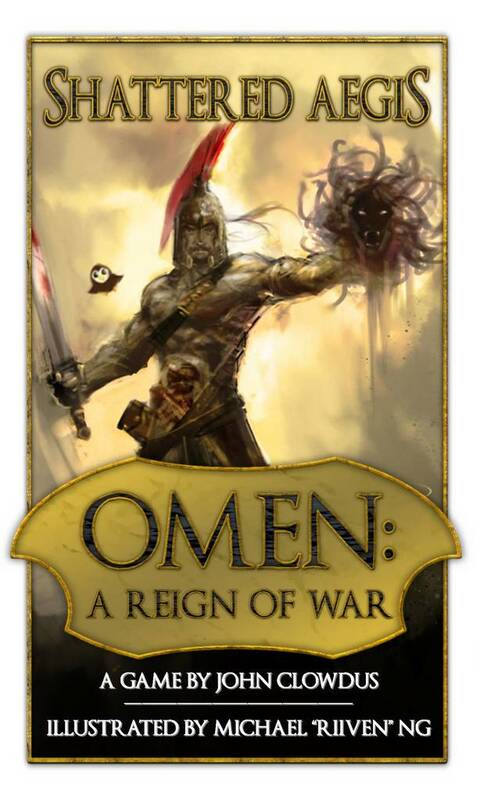 There's this amazing expansion that offers lots and lots of incredible options and awesome ways to play the game, and the only people who can use it are people who already have Omen. And that's sad, because Shattered Aegis makes Omen so much better that it would appeal to even more people, but they can't get it because it's sold out. Reprint, dammit! This is where that thinking-small thing makes me sad. Just looking at his two most recent games, Omen and Hemloch, John Clowdus has a couple of games on his hands that could be household names, if only there were enough copies to be in everybody's house. If Small Box Games ran itself like a big-time publisher, with printers in Brazil and thousands of copies and full-color advertisements, I think it would only be a matter of time before the company was a major contender in the world of hobby gaming. Thank God he started using professional artists - the games are freaking beautiful, and are inherently more fun because they're better looking. Now if we can just get him to understand that everybody should be playing his games, maybe we can get him to make enough of them that he can retire to the Azores and sit around his cabana all day, drinking mai-tais and inventing brilliant games. But then, even if that doesn't happen, those of us who know about Small Box Games can continue to be delighted at his genius. We know enough to buy anything Clowdus creates, because we know we'll never get another shot at it if we miss it the first time. And we'll get to play some really fun games because of it. Like Shattered Aegis - which, I just found out because I looked it up, actually means 'Shattered Dinner Plate,' which frankly doesn't make any sense to me at all. My copy arrived on Friday - those are some dang nice new cards. That's both the art and the abilities. I'm looking forward to mixing them in and watching the blood flow! I've been introducing Omen and its expansion to everyone I know. It's just such a great game! Omen truly deserves a much wider audience. You're right, too, that Aegis really cranks it up a notch in so many good ways. Just to be an arogant prick, aegis means shield in Greek. I know, but 'shattered femur' is funnier.